I have always loved animals. As a child our Irish Setter was my constant guardian. When I was older we had Golden Retrievers, hence my love for the breed. When I was in high school, our first golden, Holly, had puppies. As a 12 year old watching her have her pups I was in awe at the natural mothering instinct and the miracle of life. Perhaps this is when my quest for natural health for animals and humans started? We kept Kaylie, one of her pups. We did also had a cat, who stayed out of the way of those pups! I started riding horses and loved being in the barn, simply for the peace and the wonderful smell of horses. I was exposed to chiropractic for animals when my chiropractic mentor, Dr. Susan Shaw in Barrie, started adjusting animals while I was still in chiropractic college. This planted a seed. It wasn’t until I finally had my own puppy, Jasper, that I realized how much more I wanted to be involved with animals. He truly changed my life! In 2010 my parent’s Sheltie, Baylie, started limping. With all of my human knowledge, I still couldn’t help him. It was the kick I needed to enroll in the incredible Animal Chiropractic program at the Veterinary Chiropractic Learning Centre; an intense 6 month program for Veterinarians and Chiropractors together. We shared much knowledge and passion for animals! I was lucky to have many volunteers who allowed me to work on their horses, dogs, and cats throughout my program and beyond. I am happy to say, that Baylie was one of those case studies, and I was finally able to better appreciate his limp and help him with chiropractic adjustments! 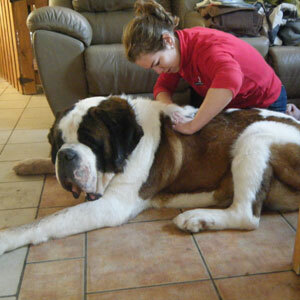 I continue to be inspired by all of my animal patients’ healing progress through chiropractic. In all my years taking care of people and their families, I have never had so many people near tears or wanting to hug me as I have in helping their animals. We have our animals purely for the joy they bring us. When they aren’t well or aren’t at their best, our source of joy becomes a tremendous stress in worrying and caring for their welfare. Further, we often try to act humanely and let our animals go when they seem to be suffering. I have had the opportunity to see the stress lifted and an extended life for animals able to get back to better movement, all with chiropractic adjustments. For younger animals, it means staying fitter and healthier for longer. And for their humans, that often also means they get the joy, but also the exercise as well! It is a joy and a true passion to be able to help the four legged family member we love so much! I am so passionate about healthy living for animals AND humans, that I love speaking publicly, so please feel free to contact me if I can be of service to your group or organization. HOW DID I GET INTO ANIMAL CHIROPRACTIC? | HOW DID I GET INTO CHIROPRACTIC AND DO I STILL SEE HUMANS? | WHAT IS CHIROPRACTIC?